Known for its magnificent Palaces and Majestic buildings, sprawling gardens and tree lined boulevards, Shimmering Silks and Sandalwood, the 'City Royale' always figures in the tourist's itinerary. It conjures up visions and memories of the resplendent glory of the illustrious Wodeyar Kings. This former state capital is a seamless blend of old-world charm and modernity. It retains its tradition in music and dance, art and literature. Mysore is the second biggest city in the state of Karnataka. It lies 130 km's from the State. Headquarters, Bangalore. It is the erstwhile capital of the Mysore Maharajas, who ruled Mysore State from this royal City. 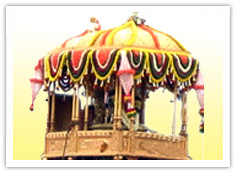 Mysore Dasara is a Royal Festival Celebrating victory of Truth over Evil. Legend has it that the Goddess Chamundeeswari or Durga slew the demon Mahishasuran on Vijayadashami day. Dasara is a 10-day festival in the region culminating on Vijayadashami. In Karnataka, Dasara is observed as State festival - Nadahabba, because of the celebration of the festival is steered by the Royal Family of Mysore. The royal family of Mysore performs special Pooja on the occasion of Dasara. During Dasara, the entire City is decorated and illuminated. Cultural programmes by famous artists are arranged in the Palace along with Sports, Wrestling, Poet's meet, Food Festival, Film Festival witnessed by a large number of people.